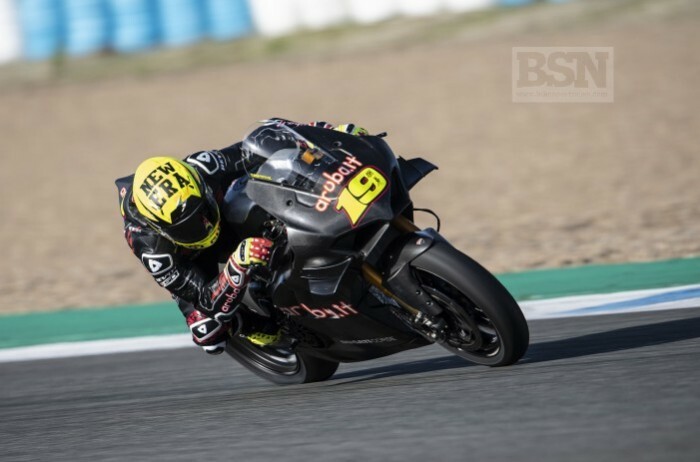 Alvaro Bautista’s arrival in the WorldSBK paddock has been eagerly anticipated, but in his first test day on his Aruba Racing Ducati Panigale V4R was good enough to see him second overall. He did reach for a qualifying tyre – two in fact – to see how they reacted after using race tyres. This extra grip, of course, helped his ultimate lap times, but it was also a measure of just how confident he felt on the first day in an entirely new paddock, on an entirely new bike. “I think it has been a very positive. To start in this way is better than to start if you are the last and have problems and do not feel good with the bike,” he told bikesportnews.com. “For sure we have a good start but it is only the beginning. We have a big margin of improvement. Tomorrow, we will just stay on the same plan as today. Maybe we will make some changes on the bike, but just to understand if we put the bike higher, how it reacts, or shorter or longer. So how did a WorldSBK bike feel first time out? “For sure it is very different form a MotoGP bike,” he explained. “This morning I did my first exit with a rain tyre because the track was with some wet patches. I did one lap and changes the tyres because it was impossible. “It was like a pudding! With the slick it did not change a lot, and still moved a lot! But I have to adapt myself to this movement because it is quite normal with this bike and these tyres. I enjoyed the day because I stated to discover the bike and start to work with the team, and I did not know them guys here, only Giulio Nava, that worked with me in Aprilia. The question everybody wanted to ask was just how much like a vee-four MotoGP Ducati it was. How much MotoGP has made the transition to the new range of Ducati street-based machines? Bautista was even faster than Chaz Davies, his new team-mate, even if the Spanish rider used qualifiers, and Davies needs an operation soon to fix his long-time injured right shoulder. “I was surprised to be as fast as I was, because I did not expect to make that,” said Bautista. “For sure I tried a Q tyre, because it is new for me and I wanted to try it and definitely you feel the extra… it is not really extra grip.